Twice a year Edify hosts a retreat, in partnership with APRENDI and ASPIRE, designed to reach school directors. 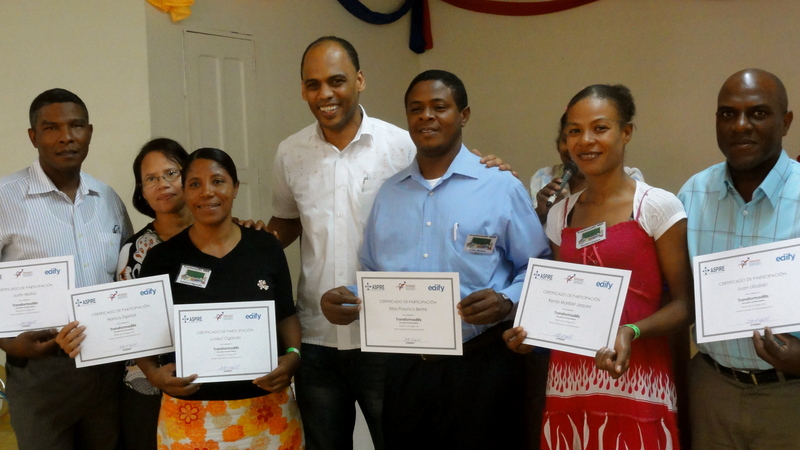 The retreats are full of informative and relevant seminars focused on improving Christian education in the DR. This is an opportunity for school leaders to grow together spiritually, to rest and reflect, and to collaborate as peers.We believe these school leaders deserve a chance to experience something new, transformational and refreshing. Their hard work is not celebrated enough; many of them are silent heroes in their communities, accomplishing incredible feats daily and usually living very humble lifestyles. The retreats also give us as partner organizations the opportunity take our relationships with schools to another level. It is a rare blessing to have 75 leaders from small Christian schools gathered together for a time of fellowship. With each passing retreat I am seeing more cohesion and solidarity forming amidst school leaders. The most impacting moment for me during this past retreat was seeing all 75 participants gathered in the auditorium, seated in a circle as Geraldo Orozco, the President of ASPIRE, led an inspiring closing discussion. He listened to voices of the directors, spoke words of encouragement, and applauded their continuous efforts of providing quality Christian education. The truth is that their work is invaluable; it has the power to change the course of the future for the students they are educating and ultimately the communities they live in. The retreat is one small way we are encouraging directors to persevere in their valiant efforts; it is a way to offer them something meaningful they might not normally have the opportunity to experience. One director from Santo Domingo shared ”We give thanks to the Almighty for you. This has been an instrument of honor to serve and to help the growth of these Christian schools.” We are grateful that we are able to work with these schools, serving them and also being blessing by them along the way.